Welcome guests to your table with a bouquet of fresh rolls. 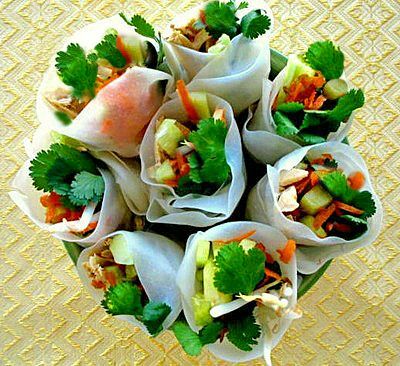 This Thai recipe for fresh rolls is simple to put together, and also can be made vegetarian. They make a great finger food for parties and potlucks, or serve as an appetizer or a main course offering (makes a perfect substitute for salad, but also includes enough protein for a complete meal). Fresh rolls also are a terrific snack for any time of the day or night. As a bonus, they're very healthy—low in both calories and fat, and naturally gluten-free. Set rice wrappers aside. In a cup, stir together the soy sauce, vinegar, fish sauce (if using), and sugar. Place rice noodles, shrimp, bean sprouts, Thai basil, coriander, carrots, and spring onions in a large mixing bowl and drizzle the soy sauce mixture over. Toss to mix. Fill a large bowl with hot water (but not boiling, as you’ll be dipping your fingers into it). Start by submerging one wrapper into the water. It should soften after 30 seconds. Remove the wrapper and place on a clean surface. Add another wrapper to the hot water as you fill and roll the first one. Place a heaping tablespoon of roll ingredients toward the bottom of the wrapper. Spread out the ingredients horizontally (in the shape of a fresh roll). Fold the sides of the wrapper over the ingredients, then bring up the bottom. Tuck the bottom around the ingredients and roll to the top of the wrapper. To secure the roll: Wet it with a little water on your fingers and press (like sealing an envelope). For more detailed rolling instructions (with pictures), see how to make Thai fresh rolls. To serve, place your platter or bowl of rolls on the table along with the dipping sauce. Eat with your fingers and lots of napkins. In a saucepan, mix together 1/2 cup water, tamarind paste, 2 teaspoons sugar, 1 tablespoon soy sauce, 1 tablespoon fish sauce, arrowroot powder dissolved in water, and 1 clove minced garlic and heat. Taste for saltiness, spiciness, and sweetness, adding more fish sauce (instead of salt), more sugar, or more chili as desired.The sauce can be served warm or cold.